Hajj is one of the five pillars of Islam. 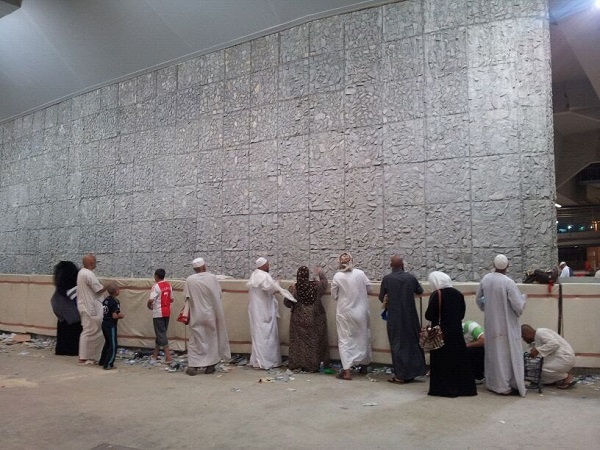 The Hajj pilgrimage has its roots in the time of Prophet Ibrahim. He constructed a building in Mecca called the Kaaba with his son Ismael as a center of worship for mankind. Since then, pilgrimage to this holy city has been occurring annually for thousands of years. 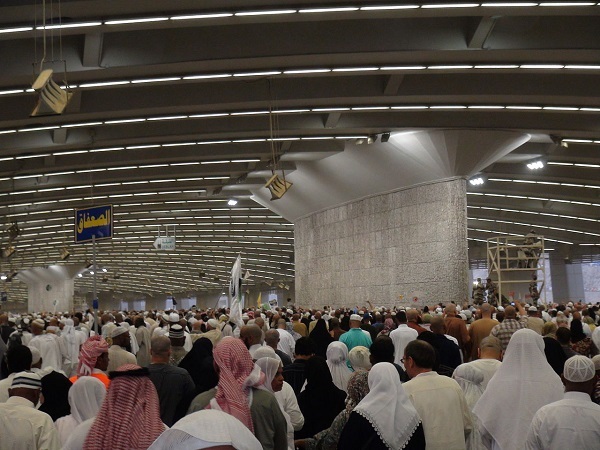 The Hajj rituals are performed mostly in the area of Mina, Arafat and Muzdalifah. Tawaf and Sayee are performed in the premises of the Kaaba. 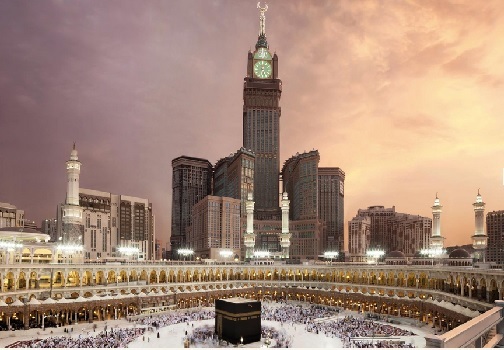 With our professional experience in oragansing hajj, Hajj travel Ltd have organised two packages that allow you to maximise the benefits of your journey and enables you to concentrate on that which is important at affordable prices. With our experienced team who will be with you at every step to provide a high standard professional service so that you will have an enjoyable and comfortable journey. Imams who will give you full guidance and answer all your questions will also accompany you on the trip. Make sure to arrive 3 hours before the flight to the Airport. For Brothers (only) do not forget to take with you the Ihram as we need to perform the Ihram on board of the plane 30 minutes before landing. 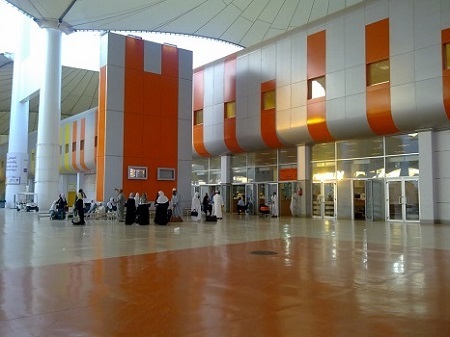 From Jeddah airport we will take a bus provided by the Ministry of Hajj to Makkah. 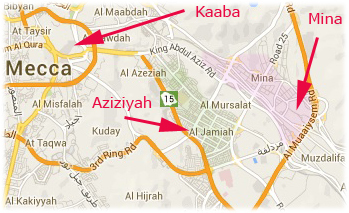 On the Journey from Jeddah to Makkah be prepared to go through checkpoints requested by Saudi Authority. 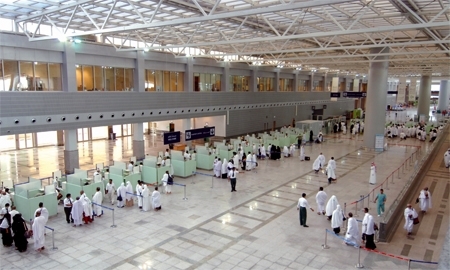 This picture shows Hajji going through the Passport and Immigration check at Hajj Terminal in Jeddah. 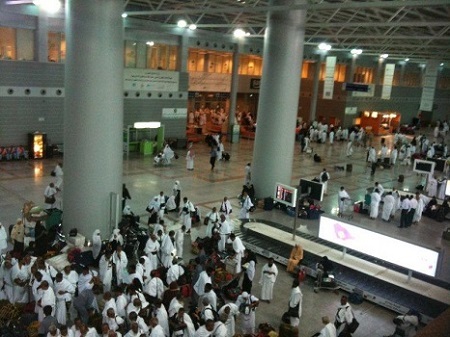 The process from landing to this stage may take around one hour or more, due to the huge number of Hajji arriving at the same airport from different countries. This is the luggage area just after the Passport and Immmigration check. After The Passport and Immigration and after you collect your luggage, you will be directed outside the arrival terminal. The next stage in your journey is to regroup in the waiting area. Last year (Hajj 2018 the process was very improved by the Saudi Authorities which it's took less than one hour. In Shaa Allah we will arrive at Makkah on the 5 Aug 2019. From 4th to 7th Thul Hijja 1440 (5 -8 Aug 2019) we will stay in Aziziyah Building near Mina and about 02 miles to Al Haram (10 minutes by vehicle but with the crowd it may take longer). Our dear Pilgrims are staying there dividing accommodation, male and female staying separately (4/5 people per room). Due to the huge number of Hajji (Masha Allah around 3 million ) all movining toward Mina on the 8th Thul Hijja, and as the Saudi Authority is in charge of the movement of the Hajji, we will move when the bus provided by the Ministry of Hajj arrive at our accommodation. So every one should be at Aziziyah appartment just after Isha on the 8 August 2019. 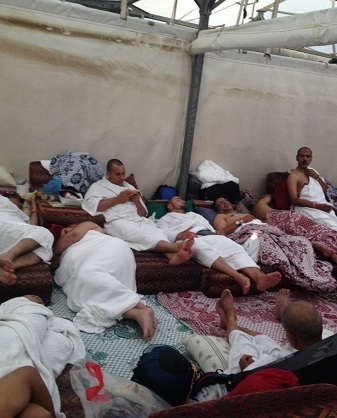 We will stay in tent provided by Moassasa with sofabed and pillows (image taken from Hajj 2013). Breakfast, Lunch and Dinner, tea- coffee will be provided that day. We will pray Dhuhr, Asr, Magrib, Isha and Fajr, shortening the four unit prayers so as to make them two units each, without combining them. Refere to Hajj Rituals page, Hajj paragraph, on how to accomplish the remaining Hajj ritual. On the Day of Arafat the 9th of the Thul Hijja and when the sun rises, we go to Arafat and stay there until sunset. This is the greatest Day of the year which Allah forgives in that day much more than any other days, so brothers and sisters don't miss this opportunity and make as many supplications as possible while facing the Qibla. The Prophet-may the peace and blessing of Allah be upon him-prayed thus: "There is no Deity but Allah alone. He has no partner. All dominion and praise are His and He is powerful over all things. At sunset we go from Arafat to Muzdalifah and there we pray Maghrib and Isha, combined as soon as we arrive to Muzdalifah. We remain there, in Muzdalifah, making supplications and remembering Allah till Fajr prayer. 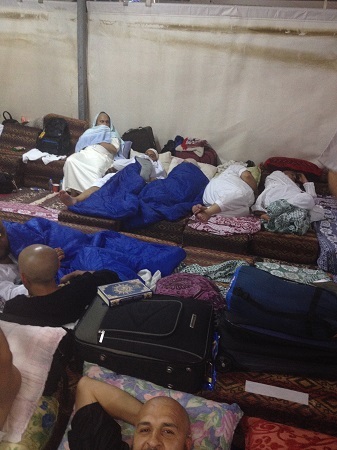 There is no tent in Muzdalifah so we advise all our Hajjis to have a sleeping bag. Breakfast and dinner provided that day. Refere to Hajj Rituals page, Hajj paragraph, on how to accomplish the remaining Hajj ritual. We have to spent this night in Muzdalifa - it is wajib (complusory) - and as soon as we arrive we have to pray Maghreb and Isha combined. 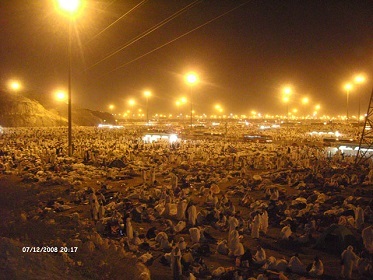 In Muzdalifa there no tent, it is an open yard, so you need a sleeping bag for this night. Some brothers and sisters found Muzdalifa very uncomfortable and sometimes get very upset. Hajj is not holiday package staying in 5 stars or 3 stars hotel, Hajj is Mina, Arafat and Muzdalifa where all peopple are equal leaving behind all their wealth and their luxury coming toward Allah asking for forgivness, remembering that Youm Al Qiyama (Judgment Day) we will rise from our grave naked facing our fate. After Fajr prayer and just before sunrise we leave Muzdalifah to Mina to stone Jamarat Al-Aqaba. 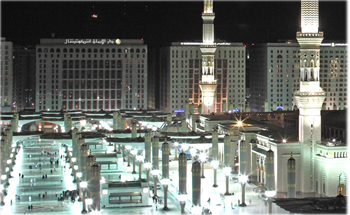 For the weak, it is permissible for them to leave Muzdalifah and go to Mina after midnight and stone the Jamarah. Hajj Travel have no responsibility for Jamarat, Group arrangement or transportation facilities, however our team will help how to get there (around 60 min walk) from the tent. Dinner provided + tea and coffee Refere to Hajj Rituals page, Hajj paragraph, on how to accomplish the remaining Hajj ritual. 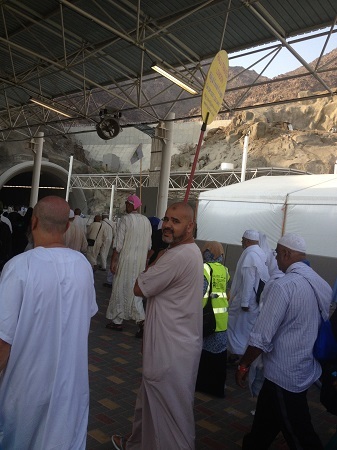 We will stay in Mina till the 13th of Thul Hijja as the Prophet (SAW) did. Each day we stone the three Jamrat in the afternoon. On the 13th of Thul Hijja, the last day of Hajj, we stone the three Jamarat pray Dhuhr an Asr combine and Stay in Aziziyah Building for one night food will be provided. Hajj is know Completed, May Allah accepte our Hajj and our deed. 11 and 12 Thul Hijja: Full Board. 13 Thul Hijja: Breakfast. Refere to Hajj Rituals page, Hajj paragraph, on how to accomplish the remaining Hajj ritual. After throwing the last Jamarat we go to Aziziyah Building and stay two nights. Food will be provided. On the 15 Thul Hijja (16 Aug 19 ) we will check in at Raffles 5 Star Hotel and stay 6 nights with half board. From the 22 to 26 August 2019 we stay in Intercontinental 4 stars hotel (previously 5 stars)with half board. In Madinah Prophet’s Mosque the sunnah is to do four Rituals: 1) Perform at Least two Rakaas at the Rawdha (It is small area In the Prophet’s Mosque clearly defined by green carpet). 2) Visit and greet the Prophet’s Grave and his two companions Abu Bakr & Omar. 3) Go to Bakee cemetery. 4) Go to Shohada Uhud and Quba Mosque and perform two Rakaas. Make sure to perform all Salat In Prophet’s Mosque. Return to London from Jeddah airport.